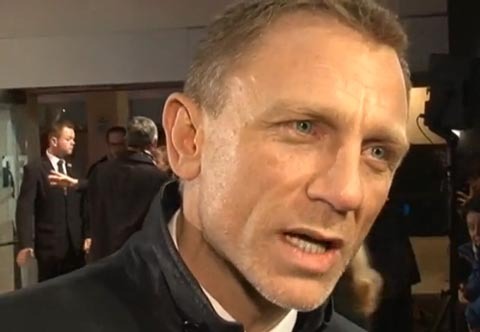 In another media “he said, she said”, Daniel Craig has denied ever calling the Kardashians ‘idiots’, in a brief red-carpet Q&A with our colleagues at ITN. The actor, promoting the remake of The Girl with the Dragon Tattoo, wonders how he could have ever given them a label, considering he has never seen their TV show. ‘I haven’t read this article, so I can’t comment about it … I’ve never seen The Kardashians, so I actually don’t know how I could have done that,’ he said. The principal online reference we could ﬁnd to the alleged quotation was a promotional entry in British Vogue’s website, publicizing the January 2012 issue of British GQ. ‘Craig was equally reluctant to talk about married life—citing the Kardashians as an example of the reality show tell-all culture that he considers his approach the antithesis of. The story made its rounds in the media. In the overwhelming majority of cases, Craig’s quotation was published before the GQ interview was released, with media citing it as though they had read it. Media also gave their take on it, which, based on our analysis, wasn’t what Craig actually stated. Based solely on the excerpt above, Craig simply extrapolated an idea on what he would do from the Kardashians’ desire to ﬂaunt their lives publicly. At no point did he call the Kardashians ‘idiots’. However, it’s tempting to connect Craig’s analysis with a criticism of the Kardashians—simply because one sentence followed another. It’s often done by media, probably even by us (errare est humanum), because people want to ﬁnd justiﬁcations for what they read or hear. Nevertheless, there are now claims the Kardashian family expects an apology, according to the tabloid press. If true, one would think that, as the frequent subject of many misquotes themselves, they would be more insightful. Or, for that matter, as public ﬁgures, one should be able to rise above it—or, until they hear it from Craig directly, understand that the media are a ﬁlter. Welcome to the world of 24-hour news and round-the-clock gossip—and those celebrities that seem so easily baited by them.